Having the distinct and prominent leak-resist cup design, the UNIMAX 25 atomizer completely keeps you away from leakage or flooding. 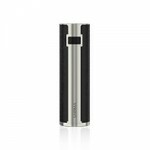 It adopts the exclusive TFTA system where airflow control and e-liquid filling can be easily achieved by rotating or removing the top cap. The UNIMAX 25 battery presents you with two optional modes: direct output and constant voltage output along with advanced dual circuit protection. With wide open structure, the new BFL series coil heads will give you a purely nice flavor where both mouth-to-lung and direct-lung vapers are satisfied. Meanwhile, the premium finish with colorful changeable stickers make the UNIMAX 25 a sensational masterpiece. The Joyetech exclusive TFTA (top-filing and top-airflow) technology was perfectly applied into the UNIMAX 25 atomizer. Simply rotate the top cap to the left or right to adjust the airflow inlet. Unscrew the top cap and inject the e-liquid into the side holes from the top. The UNIMAX 25 comes with a large battery capacity of 3000mAh. It lasts you a rather long time of vaping. under power mode with wattage setting at 40W to 80W. The UNIMAX 25 atomizer along with the newly constructed BFL coil heads can ensure a large airflow inlet, producing a total pure flavor ever. Being simple and convenient to operate, UNIMAX 25 applies two modes: Direct Output mode and Constant Voltage Output mode. (orange light). Release the fire button to choose the current mode. The UNIMAX 25 atomizer comes with UNIMAX mouthpiece. Make sure it is in position before put it in. You can use normal 510 mouthpiece as well. Unscrew the upper component, you'll find the atomizer head attached on the vent pipe. Remove the coil head to replace or clean. We have several colorful stickers for you to change, which is elegant and textured. The button light will flash slowly or stay lit when battery quantity is high, on the contrary, the light flashes in frequency. Simply charge the UNIMAX 25 by connecting it with a PC or Joyetech wall adapter via USB cable. 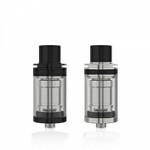 The former BF series heads (exclusive BF RBA/LVC/QCS) for CUBIS or CUBIS Pro can also be used in the UNIMAX 25 atomizer with the help of the BF adapter.